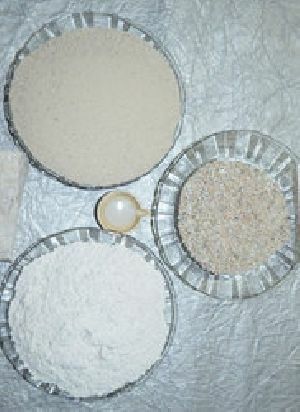 in ceramic bodies, the main vitrifying (fluxing) agent is feldspar. The majority of white ware bodies contain good proportions of feldspar. It acts as a flux. In the ceramic industry, the flux is defined as that portion of the body which develops glass phase. This is provided mostly by feldspar. The amount of flux in a ceramic body should be only in such a proportion as to develop the desired amount of vitrification. If excess of flux is added, the fired body becomes very glassy and consequently, brittle. the glass and ceramic industries are the major consumers of feldspar and account for 95% of the total consumption. standard packing available in 50 kg hdpe bags and 1or 1.25 m t jumbo bags with liner inside , or as per customer requirements.